Mage-reading, Peaceful Aura (radiates from white fur side), Black Blood (poisonous, black-fur areas only), Soothing Voice, Hypnotic Thrall, Shadowmancy (manipulate/create shadows), Shadow Teleportation. Wingless Flight. Already cursed to live an interesting life due to her lineage, she had the additional curse of being born under the Eclipse. 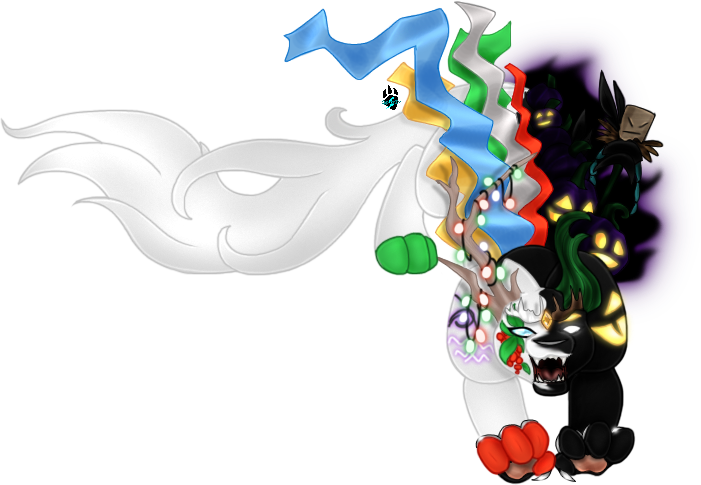 Afflicted with a chaotic Elemental Mutation that caused half her body to side with her Christmas side, and the other half to embrace her Halloween side. She's a combination of opposing forces, and neither one is ever going to win. On the Christmas side of her body she radiates a Peaceful Aura that calms and soothes those near her. She has a branch growing in front of her ear that has a trail of glowing lights wrapped around it. The lights are always glowing, and strangely, seem to shift hues depending on her mood. From her shoulder she has long flowing ribbons of silk wrapping paper. These ribbons are invulnerable to harm and can be grown/extended at will. She can use them to wrap/tie up others in an inescapable hold. On the Halloween side of her body she has na Aura of fear that rises from the black flames that shadow the jack'o'lanterns and scarecrow that haunt her back. Those who stare into the black flames too long will swear that the pumpkins and scarecrow are alive - they seem to move, and give off a sense of sentience. When someone attacks her the scarecrow will detach from her back and attack her assaulter - tearing into it with a strength and frenzy that doesn't match its small and seemingly frail design. She wears a crown made from ivory and wood, with an orange gem encased in it's center. The gem once had power, back in the world where she and her yearmates were taken, but lacks any power now. It seems that it's powersource was something unique to that world, so the gem is only decorative now. She also wears silver rings on her front paws. Her yearmates and her were taken into a world where intrigue and magic were the most dominant force. There were Raveens living there - old, ancient, and of no Element leaning - who raised them among their court. The only threats that existed were the other tribes of Raveens, and their courts of followers. The danger came in the form of information and words. In betrayals, alliances, and courtly affairs. Some of her fellow yearmates fell to the betrayals - executed by the other courts when they were found out - but most of them made it out alive. Upon returning to the Ice Plains it was a bit of a culture shock. Here the threats were much more real. Powers: Nightmare Stampede (creates a stampede of fear and pain that washes over an area, disabling and hurting all those caught in its path), Frosty Paranoia (makes a target briefly confuse an ally for an enemy - if they attack their ally, they're instantly frozen solid).